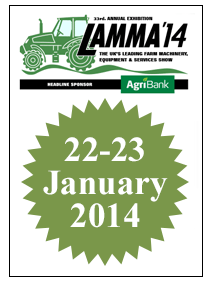 2014 Lamma Show Bigger & Better than ever! For its 2014 outing, The Lamma Show has relocated for the third time in its history, due to an increase in visitor and exhibitor numbers alike. The Farm Machinery, Equipment and Agricultural Services Show which celebrates its 33rd show this year has made the move to the East of England Showground in Peterborough, in response to comments and feedback from visitors and exhibitors alike; and also has a new sponsor – AgriBank. The new venue offers better route access and exit, along with room to grow further in future years, whilst remaining true to its roots. “LAMMA prides itself on being the UK’s leading farm machinery equipment and services show and we are dedicated to offering a show that can continue to develop and provide both exhibitors and visitors with the best possible experience. “We are committed to preserve the unique heritage and the friendly and informal atmosphere of the LAMMA show. It remains, at its heart, an easy and free to attend event for farmers to see the latest agricultural machinery, equipment and services from around the world. The show runs from 7.30am – 5.30pm on 22 January and 7.30 – 4.30pm on 23 January, with both car parking and access free of charge. This entry was posted in Industry News and tagged agricultural shows, east of england showground, farming calender, lamma show 2014 on January 7, 2014 by agratech.